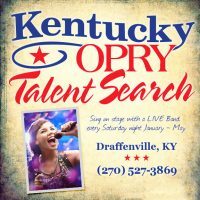 Kentucky Opry Hosts Talent Search! 2019 Kentucky Opry Talent Search ~ Open Competition – Every Saturday Night from February 9, 2019 to April 6. Come and be a part of choosing the 2019 Winner! or be a contestant yourself.